Boardman: William J. Reedy, Jr., “Sir William” passed away peacefully on February 13, 2019 at his home with his wife, Sally, his namesake, Trea, a daughter Kelly and son-in-law, Colin at his side after an extended illness. Bill was born June 9, 1940, in Youngstown, the oldest son of Velma Warren and William J. Reedy, Sr. He graduated from Woodrow Wilson High School, where he met and married the love of his life, Sally Billings. Bill attended Wittenberg University and graduated from Youngstown State University. He retired from IBM after 30 years of service and dedication. His strong work ethic earned him many vacation trips which he and Sally truly enjoyed. Bill was not really ready to totally retire, he became the office manager for his daughter and son-in-law Drs. ‘Kelly and Colin Moorhead at Northeastern Ohio Medical Specialist in Akron. Bill would tell you, Kelly and Colin were the best doctors he could ask for. Church was an important part of Bill’s life and he was a member of Westminster Presbyterian Church in Boardman, where he sang tenor in the choir and loved all music. 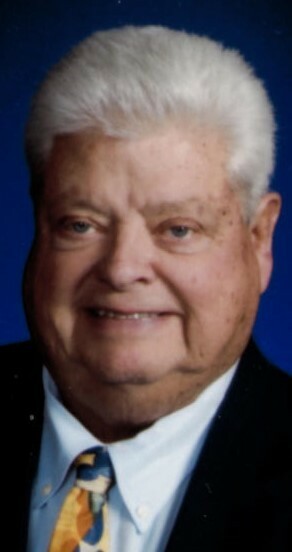 Bill was a life member of DeMolay, where he served as master councilor and received the Chevalier Award. He was a member of Tippecanoe Country Club, served two terms on the board of directors and played as much golf as he could. He was honored to have two holes in ones. Bill was also a member of the Sharon Social University Fishing Club and enjoyed years of vacations at Lake Musokoka in Canada. Just a few years ago, he completed his bucket list with a trip to the Grand Canyon. He was a life member of Boardman Rotary and received the Paul Harris Fellow award and a member of the Cameron Club of Youngstown. He leaves to cherish his memory his wife of 58 years, the former Sally L. Billings, whom he married on September 2, 1961, a son, William J. Reedy, III “Trea”, daughter, Dr. Kelly L. Moorhead (Dr. Colin Moorhead) and his sister-in-law, Crissie Reedy of North Dallas, TX. Bill was blessed with 5 grandchildren who meant the world to him, Alyx Schumaker (Nikki) and William J. Reedy, IV “Liam”, both of California, Sarah Moorhead, Colin Moorhead, II, and Ryen Moorhead, all from Akron. He loved being an active part of their lives and being involved in as much as he could with them. There will be a Memorial Service on Saturday, February 16, 2019 at 2 pm at Westminster Presbyterian Church, 119 Stadium Drive in Boardman with Reverend Adam Rogers officiating. Family and friends may call on Saturday from 12:30 to 2 pm at the church, with services to follow. The family would like to thank Hospice of the Valley for the outstanding care Bill received in the past two months. The family requests that material tributes take the form of contributions to Hospice of the Valley, 5190 Market Street, Boardman, OH 44512 or to Westminster Presbyterian Church Memorial Fund, 119 Stadium Drive, Boardman, Ohio 44512 in memory of Bill.